Josh and I bought our very first RV last week, and as promised, here's the scoop! If you've been reading our blog, you'll know that we had been considering class A diesel motorhomes. If you haven't been reading, here's the place to learn about why we're making the decision to become digital nomads. So you may be a little surprised to learn we settled on a fifth wheel. There were several contributing factors to this decision. 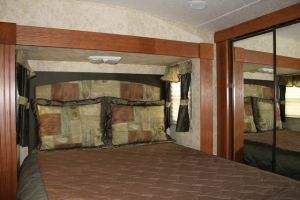 Keep in mind we're total RV newbies, having never driven in or even slept in one before (or still! ), so our decision was based on lots of research and stories from other full-timers. Cost: The cost of a used fifth wheel is significantly less than the cost of an equivalent-length used motorhome of the same age and general niceness. That being said, you have to buy a tow vehicle that can tow a fifth wheel too, and that's not cheap. For us, this route still ended up making more financial sense; with a motorhome, we would have sold one of our two cars and towed the second one, but with a fifth wheel we can sell both of our cars to buy a truck. 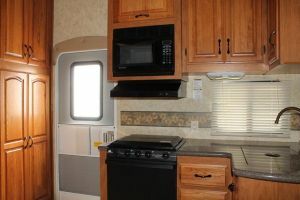 Instead of spending a good amount of money on a coach and having two vehicles to maintain, we'll spend a little bit more for the fifth wheel and truck and only have one vehicle to keep track of. Plus we'll have more cash to accomplish this from two car sales than from one. Flexibility: If our truck needs maintenance, we won't have to sacrifice our entire home to the repair shop. 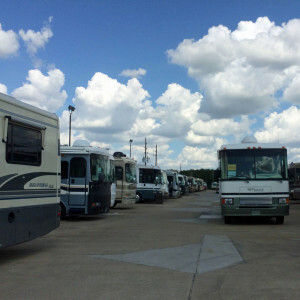 Recently, our full-time friends at RV Wanderlust were unlucky enough to have a mechanical scare, but fortunate that it happened to be while they were planning to be at a timeshare in Florida. Hearing about their experience made us realize we'd rather be without a vehicle for a few days than without a vehicle and a house. Also, we like the flexibility of being able to set up our home and then disconnect the truck to be able to run into town or go exploring. 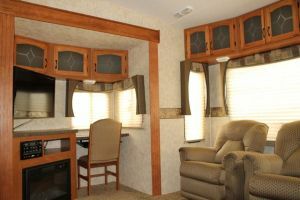 Living Space: Because there's no driver's or passenger's seat in a fifth wheel, the whole trailer is dedicated to living space. In our case, we have 36 feet of uninterrupted home to enjoy. There's a trade-off here: much less storage space under the floor. We're using that as a challenge to get rid of as much stuff as possible. 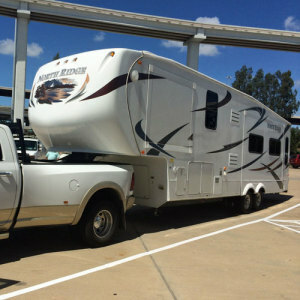 Maneuverability: I don't know if driving a big truck towing a fifth wheel is easier than driving a ginormous motorhome, but it sure seems like it should be. Fingers crossed. This list doesn't mean we think fifth wheels are better. For some folks, motorhomes are perfect. 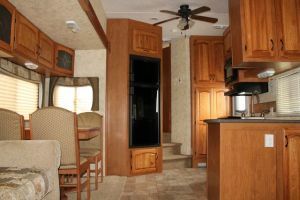 Ultimately, I think we'd enjoy living in a motorhome just as much as a fifth wheel, so long as the floorplan fit our needs. We're mostly just excited about the adventures we'll have. So with no further ado, on to the photo tour! 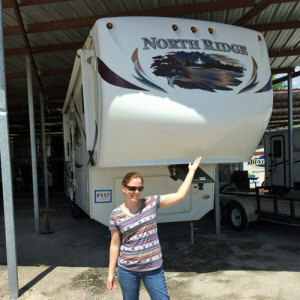 Welcome to our new home-to-be, a 2011 Coachmen North Ridge! It's a 36 foot fifth wheel weighing a bit over 11,000 pounds. It has three slide outs, an outdoor shower, an awning, one large pass-through storage compartment, and a shallower front storage compartment. On the inside, there's a petite kitchen with a gas stove and oven, a convection microwave, a double sink and a decent amount of counter space. 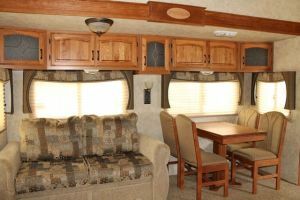 Across from the kitchen is an expandable table with dining and a loveseat sleeper sofa. Full disclosure: we're most likely getting rid of both of these. More on updates as they occur! Did I mention it has a ceiling fan? I'm really excited about that. I'm also excited about the fact that it has a ready-made kitty litter box area under the fridge. See the tiny door? The living area is totally cozy, with the loveseat, two recliners, a desk, tv and electric fireplace. Truth be told, we're probably also getting rid of the recliners in favor of a second desk for Josh. Future blog posts will come from this desk! Having two slide outs across from each other makes for a really expansive living space. This is one of the reasons we fell in love with this RV. 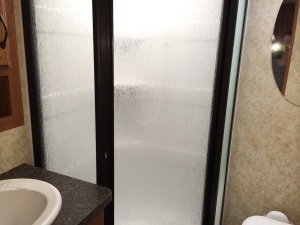 The bathroom is enclosed, rather than being a part of the bedroom — something we like a lot for when we have guests. Across from the bathroom is a linen closet. Sink, shower, toilet. The works. The bedroom has a spacious wall closet, an all-in-one washer/dryer unit, a chest of drawers and a corner cabinet. Also way too many mirrors. We have a fair number of changes we're planning on making, and we'll keep you posted as we transform our new home with our own style. In the meantime, she's just hanging out in a storage facility until we get a truck to tow her on her first adventure! 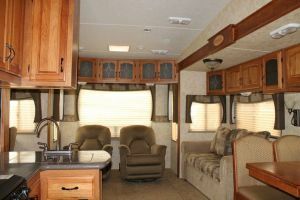 What are your thoughts on Class As versus Fifth Wheels? Do you think we made the right choice? Don't hold back!